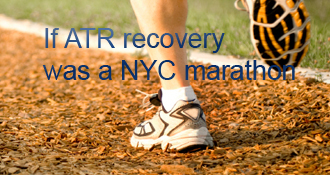 marissa23 has completed the grueling 26.2 ATR miles to full recovery! Goal: 360 days from the surgery date. Week 4 brought about some new challenges.the infection had cleared up but it left behind some granulation tissue which had grown up through the cut and out of my leg. This opened up the wound even more and was preventing the skin from growing back over and closing the wound. The doctor decided to “freeze” the granulation tissue which would hopefully allow the skin to close back over. Week 4 was also the week we were told we could not travel to Europe as planned. This was probably the most devastating news I’d had throughout the whole injury - even finding out I had to have surgery wasn’t this tough! We were due to fly out on the Saturday but were told not to go on the Wednesday so we had a couple of days to try and reschedule everything for a later date. Luckily I had plenty of time on my hands since I was sitting at home for another week. At week 3 I returned to work it wasn’t very comfortable and my foot was quite achey by the time it was home time. As soon as I would get home I would plonk in front of the tv with my foot up and not move until it was bed time. It was an exhausting week being back at work but I was glad to be out of the house! At the end of the week my cut started to bleed in the middle I covered it over and made an appointment with my doctor for the next day. It wasn’t good news… I was given antibiotics immediately and told to stay at home for another week. The infection was only in the wound which was a relief but my planned trip to Europe wasn’t looking promising. Week 2 was pretty boring! I sat at home with my leg up and watched endless tv. The pain was bearable except when I first got out of bed each morning but that was more pain from the blood rushing back down into my foot rather than pain in my actual achilles. Week 2 did mean I could get my stitches out which was exciting! There is something frustrating about not being able to see a part if your body especially when you are thinking about it all the time. The wound had healed up nicely although there was still a bit of swelling and redness although that was all to be expected! To my surprise I didn’t actually have any stitches to remove - they were all internal. I did however have one protruding from my leg which the doctor said was normal and eventually it would fall out or go back in so we left it there! The operation went smoothly and much to my relief I woke up with hardly any side effects, I barely even felt tired!!! I was fitted with a moon boot and locked at 90 degrees before leaving the hospital and was told I could weight bear as soon as I wanted to as pain permitted. As well as being knocked out, I had a block put in so my leg was numb from the knee down for the first 24 hours which was great as I had no pain at all for the first night home. The next day the tingling and strange sensations started as my leg started to come out of its numbness. It wasn’t painful but was just a really weird feeling - lots of pins and needles and twitches. I could also slowly start to wriggle my toes which I hadn’t been able to do up until then. The second night wasn’t as pleasant as the first night and I made use of the endones I had been prescribed for pain relief although this was the only time I needed to use these drugs, the rest of the time I just took regular panadol. I was glad I hadn’t attempted to weight bear while my leg had been numb because the worst pain I have had throughout the whole injury was in the first few days after the surgery. I had little to no pain when my leg was elevated but as soon as I stood up even just to walk a few metres to the bathroom it was very painful. The first week I barely did anything the only time I moved from the lounge was to go to the bathroom or to bed. I ruptured my right Achilles during the second quarter of my netball game on a Thursday night. Both my Achilles had been feeling tight about a week leading up to the game but after warming up I wasn’t bothered by them at all. When the rupture occurred I had taken a step to start running and thought someone had kicked me in the lower calf but I didn’t hear any popping noise like some people describe. It hurt but definitely wasn’t excruciating I initially thought it might have just been a really bad cork to my calf or maybe even a slight tear to my calf muscle as the pain was higher up my leg than I would have expected for an Achilles injury. My sister in law is a physio so I got a lift back to her house after the game and she was pretty certain it was my Achilles (after doing the Thomson test on me). So the next day it was off to the doctor to confirm. He confirmed it was an ATR without any scans or ultra sounds and pretty much booked me in for surgery for the following Tuesday. I never had any doubt of taking the surgical path as I had a 7 week holiday to Europe planned for early June (4weeks after the injury occurred) I was pretty keen to get on the plane four weeks later but my doctor wasn’t so sure and told me to speak to the surgeon about it. 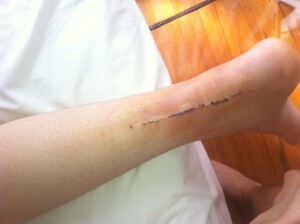 I had a half cast put on me to keep my leg still over the 4 days before the operation. I didn’t find the cast too uncomfortable but I wouldn’t have liked to be in it for any longer than 4 days (mostly due to the itching)!!!! I didn’t have much pain once my foot was stable in the cast and any pain I did have would go as soon as I would elevate my foot. On the day of the operation when my cast was taken off I had the biggest bruise going up the sides of my foot and up my leg about 6 inches. So sorry to hear this, Marissa. I hope you had travel insurance or at least that you can reschedule without too much of a penalty. If you’d gone, there would have been so many things that it would have been difficult to do with your limited walking–so think ahead to the new travel date when you are fully recovered and ambulatory! Best wishes. Yeah I am 2 weeks post, am healing very well, stitches came out Thursday and now I am full weight bearing but I have to wear a walking boot. I will take that over crutches any day. That’s pretty scaring about the infection, at least that is getting better. Hope all goes well for you. This blog has been pretty neat talking with people with the same problem. I will say this we will all get back to our normal selves but its going to be a long round. Sorry to hear about having to cancel your trip. I went to Hawaii right around the 4 week mark, but we rented a condo and didn’t do too much moving around. A much different trip than what I’d imagine a typical European vacation to be (at least my previous trips to the EU involved lots of walking!). Heal well! Sorry. I travel quite a lot. (well used to) Think of it this way, several european cities have quite a lot of cobblestone that makes walking really challenging. I hope you have a speedy recovery with your infection. I had a nerve block as well and wish it lasted two days! I agree with KIKI, just relax and let yourself heal. Good luck! Congratulations on being on the other side of surgery, Marissa! Keep that leg as high as you can–above your heart, not just above the floor or above your bottom. It will reduce swelling (which will make you uncomfortable) and speed wound healing. I saw my doc yesterday for a 5-day post-op and he commented that you can always tell which patients are following the protocol about leg elevation and which ones aren’t. (Not that you’re doing this to impress your doctor, but to speed YOUR healing and journey toward being pain-free.) Have a good day! marissa23’s AchillesBlog is proudly powered by WordPress and WPDesigner..